Aung San Suu Kyi’s singular leadership could lead to the same sense of unrealized dreams that has befallen South Africa. The world and country cheered the elections Myanmar held last November, and indeed there was much to celebrate. It marked the first freely elected Parliament since a 1962 coup, and Aung San Suu Kyi’s popular NLD opposition party swept the polls, garnering 80 percent of the vote—enough to outnumber the 25 percent of Parliamentary seats reserved for the military. But the mood had been more subdued in the months leading up to the vote. “Yes, I’ll vote. But it will not change. You know Aung San Suu Kyi? She is our leader. And she cannot be the President.” This was the refrain given repeatedly by taxi drivers and shop owners. The 2008 Constitution prohibits citizens with foreign relatives from serving as president—a provision most here see as aimed at Suu Kyi, whose late husband was British. If not for this law, she would share with Nelson Mandela the distinction of being the only two heads of state to win a Nobel Peace prize prior to taking office. They would also share the peculiarity of becoming president just five years after being released from confinement—Aung San Suu Kyi from house arrest, and Nelson Mandela from jail. But so far, this law has not stopped the Lady. As she said on the eve of the elections, “I will run the government.” Despite the NLD’s ban on any elected MPs other than Suu Kyi from speaking to media, recent reports increasingly suggest that it is likely the Lady will strike a deal with the military, allowing her to serve as president come mid-March. At a minimum, her negotiations and private meetings with the military leadership since November have laid to rest any lingering doubts that she is the one who will lead, even if ultimately from behind. For the 80 percent of the population who voted for the NLD, in spirit, at least, the people will win the day. Suu Kyi’s singular leadership could lead to the same sense of unrealized dreams that has befallen South Africa since its own democratic transition. In 1995, Nelson Mandela’s African National Congress (ANC) party won 63 percent of the votes cast, marking the end of Apartheid. By all accounts, Mandela was a transformative leader, and the Lady may be as well. But as the last decade of South African politics shows, it takes more than one visionary leader to guide a country through its democratic infancy and manage the difficult process of governing alongside a former repressor. On my first visit to Soweto, the site of police brutality and a battleground during the end days of Apartheid, a black South African friend showed me around. He told me that he worried about the future of his country. I wondered why. We had just been to see Mandela’s house. We were standing in front of the Freedom Charter, a monument to the core principles of the anti-Apartheid political coalition led by the ANC, Mandela’s party. And what had brought us to Soweto that day was the opening of a new mall—a symbol of progress for many Africans. “Because things won’t change until the generation doesn’t remember Apartheid,” he said. “Until then, the government can do what it wants. The ANC will always be the government. The people know they are the ones who saved them. They feel their job is already done.” This was in 2007, just 8 years after Mandela had left office. Six months later, President Thabo Mbeki—South Africa’s first president after Mandela—ordered soldiers to crack down on rioters protesting an influx of Zimbabwean migrants. It marked the first time the government had used military force since the end of Apartheid. Since the 2008 riots, both he and his incumbent, President Jacob Zuma, have been embroiled in numerous corruption scandals and have faced various allegations of abuse of power. 2012 marked one of the darkest moments in South Africa’s post-Apartheid story, the police shot at striking miners with live ammunition, killing 47 and injuring many more. It was a particularly sad moment for organized labor; during the 1990s, the National Union of Mineworkers had been the largest union in the country to join the fight against Apartheid. In other ways, South Africa has also shone in these difficult moments. A healthy civil society is one of the best checks against an independence political party that starts to rest on its laurels. South Africa is home to a vibrant civil society and independent media, which report aggressively on abuses of power—so much so that President Mbeki brought defamation suits against the media. The country has a public prosecutor who does not shrink from taking on the highest officials. Without such checks, the country would be in much graver trouble. Myanmar is not yet so lucky. Even with the election of the NLD, transparency has not yet come to the country—the NLD’s ban on all elected MPs other than Aung San Su Kyi from speaking to media, for example, hardly sits well. Whereas South Africa’s fight against Apartheid saw the banding together of unions and race activists, Myanmar is making its transition to democracy without the benefit of a multi-decade, multi-faceted, domestic opposition. In Myanmar, there is no parallel to the white South Africans who opposed the Apartheid government. What’s more, the Myanmar military’s crushing the first signs of protest, during the 1988 protests, scattered a nascent movement. Even though the protests that August drew from a broad spectrum of society–farmers, lawyers, monks, air force and navy personnel, students—the backlash from the military escalated quickly. Within the first week, 1,000 students, schoolchildren, and monks were killed. In a country where 80 percent of the population is Buddhist, the murder of monks, in particular, showed just how ruthlessly the military government would cling to power. By the end of 1988, an estimated 10,000 protesters and soldiers were dead; 10,000 had fled to the mountains bordering India and China, and 6,000 were in custody—all within five months. In South Africa, it took three years for the same number of people to perish. Historically, civil society in Myanmar has also focused most on responding to gaps in the delivery of social services—namely, natural-disaster response and education—rather than on political activism and holding government to account. Indeed, many politicians resist civil society apart from humanitarian organization, seen as “dollar sa” or “dollar eaters.” Those civil society organizations that remained active in Myanmar prior to 2010—the year that most consider to mark the beginning of the country’s political opening–harbor resentment toward those who left and have returned. Or, at least they feel that it is time for them to pay their dues and contribute their skills for free. So the challenge of keeping government honest will be even greater here. Thanks to the popularity of Aung San Suu Kyi, the NLD will remain powerful long after its leader, now 70 years old, can no longer govern—officially or unofficially from behind the scenes. The party needs to design policies and win support for the future, not for its past. For that to happen, dedicated Burmese expatriates need to be welcomed home and heard on equal footing as their peers who stayed. This is especially true when considering that from 2005 to 2011, the military regime allocated only 1.3 percent of Myanmar’s GDP for education, ranking the country 164th out of 168 countries in the UNDP Human Development index for public expenditure on education. South Africa can prove a useful teacher, but only if Myanmar chooses to learn the lessons of history. Just as in South Africa, leaving the country did not mean giving up the fight. ANC leaders, such as Oliver Tambo, left the country during Apartheid to gain skills abroad, network, and recruit other countries to the anti-Apartheid fight—Tambo returned after 30 years in exile in England. And yet, just before returning to South Africa, he authored the Harare Declaration, a document that laid out the road map for the ANC and its supporters to consolidate opposition to Apartheid and enter negotiations with the ruling government. There is not much that the United States or other countries can do to support this ecosystem of civil society groups, government watchdogs, and new political leaders. But they can, for example, be prepared to help those naturalized American citizens who are Burmese by birth gain dual citizenship if the Myanmar government chooses to amend the Citizenship Law of 1981, which automatically revoked Myanmar citizenship from anyone who took citizenship from another country. 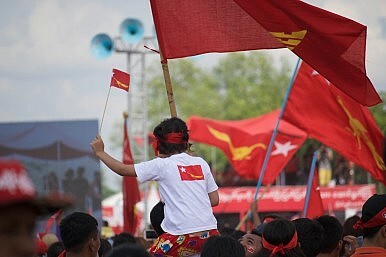 Doing that would allow more foreign-trained Burmese minds to return home and contribute fully to the country’s future. While it may seem of little importance compared to the other many pressing concerns of the country, now is the time for Daw Suu and the NLD to start nurturing second line leaders. Without a strong bench of leaders, even with democracy, Myanmar may find itself echoing South Africa’s unrealized dreams. Caitlin Pierce is a legal empowerment expert based in Yangon, Myanmar. She is a former Presidential Fellow at Open Society Foundations and previously lived in South Africa and Ethiopia, where she worked on issues of governance and civil society development.